Helpful tools for cooking and living the SCD. This diet requires a lot of cooking and that requires a lot of chopping, slicing and dicing. I recommend you get yourself a decent chef’s knife and become comfortable with it. You’ll find that once you become comfortable with it you can do things as fast with this knife as with some special-purpose chopper. These knives are more versatile and easier to clean than a gadget. Besides, how many onion choppers do you know about that are equally good at slicing up chicken or peeling garlic? See this review for more info. This tool will help you keep your knifes in top cutting form. A sharper knife is a safer knife. A duller knife requires more force to do the work and you sacrifice control when you have to apply excess force. The difference between freshly ground pepper and pre-ground pepper is immense. Once you’ve had freshly ground, you’ll not go back to pre-ground. I haven’t. I have one mill for black pepper and one for savory pepper blend. Since I’ve been on this diet, I’ve eaten a lot more salad and consequently wanted more flavor than a head of iceberg could offer. When I’m not buying pre-washed mixes of baby greens or spring mix, I enjoy a simple head of green leaf lettuce. This requires washing and for optimal storage, thorough draining. My salad spinner sees a lot of use for both lettuces and herbs. My OXO spinner is a workhorse. It also gets a workout spinning the basil I use for pesto and the mint I dry for tea. An extremely handy device that gets a lot of use in my kitchen. I use it when I make yoghurt, when I roast chicken and beef and for checking the doneness of steaks, chops, burgers and just about any other meat. The lipped part of this pan makes it especially useful for making candied pecans. It’s also great for roasting nuts and spices. Also, when I want to roast chickens I put a cooling rack on the sheet pan and the chickens atop that. There are lots of different options for making yoghurt. Some people use a heating pad, others use their ovens with a regular light bulb. Many use a Yogourmet Multi with a dimmer switch and others swear by their Excalibur dehydrators. There are pros and cons to all of these methods including cost and attention required during processing. I use a Yogourmet Multi with a dimmer switch. See this post for more info. I’ve used mine frequently to make dried fruits and beef jerky. Many also use a food dehydrator for making their yoghurt. Meat just tastes better. Vegetables taste great too. Have you tried grilled pineapple yet? It’s a treat. Also handy for smoking foods. For making refried beans and guacamole. 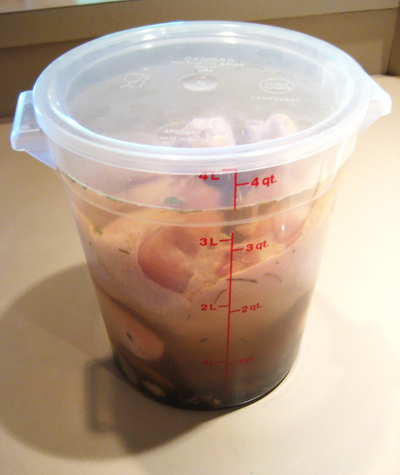 Handy for brining chickens. Here’s a photo. Most of your meals will need refrigeration so coolers and ice are a necessity when traveling long and short. So you’ll have a place for all your made ahead foods. I have a coffee grinder just for grinding spices like garam masala and chili powder. I don’t do coffee in it because the beans are oily and would leave that coffee taste in my spice mixes. The inverse is true too. I don’t want my coffee tasting like garam masala. These are extremely useful tools for preserving foods. You can’t just buy a can of soup when you’re on the diet, but you can pressure can your own and have it on hand. Properly processed canned foods will keep for up to one year. You can have soups, vegetables, fruits, applesauce, salsa, ketchup, barbecue sauce, etc., just waiting for you in your pantry. Just imagine the possibilities. I put up 20 quarts of tomatoes from my garden last fall. See the book section of the resource page for an excellent instructional book on canning.